Save over sixty percent on the hit sci-fi prequel on Blu-ray at Amazon! 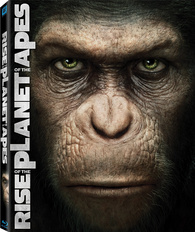 Amazon is offering 'Rise of the Planet of the Apes' for $14.99 (63% off suggested list price). From the Oscar-winning® visual effects team that brought to life the worlds of 'Avatar' and 'Lord of the Rings' comes revolutionary new ground - a CGI ape that delivers a dramatic performance of unprecedented emotion and intelligence, and epic battles on which rest the upended destinies of man and primate. Directed by Rupert Wyatt ('The Escapist'), this special effects blockbuster features fantastic supporting performances from Freida Pinto ('Slumdog Millionaire'), Brian Cox ('Red'), Tom Felton ('Harry Potter' films) and Andy Serkis ('The Lord of the Rings' Trilogy) in a ground-breaking performance. Click here to own one of the best films of the year!